WHO: Same hare as last year. WHY: Because it’s been a year (plus or minus a month) since I got here, and how better to celebrate than by attempting to relive the past! WHERE: Am Pfaffenwoog 1, Hutschenhausen (the Netto), but actually we will be meeting BEHIND the Netto, in the Mitfahrerparkplatz. 7 PM. SPECIAL INSTRUCTIONS: Bring a headlamp/flashlight and your hashin’ pants. WHERE: 160 Jahnstrasse (aka the Turn- u. Sportverein e.V. ): take the A6 to the 270 north, get off on the first ramp and take the right towards Otterbach. Take the first left onto the K8 to Erfenbach, drive about a kilometer, then turn right onto Jahnstrasse. Drive 1.3 km to the start-parking lots are on both sides. 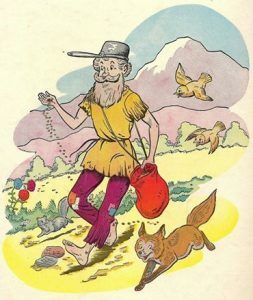 WHY: Because March 11 is Johnny Appleseed Day! Come celebrate with the Sembach Hash House Harriers by sowing your wild seed all over the countryside!